Brock Lesnar (Pictured) made his WWF (now known as the WWE) debut on RAW in March of 2002, the day after WrestleMania 18. Fast-forward 10 years and Lesnar made his official return to the WWE on Monday’s episode of RAW, exactly one night after WrestleMania 28. Over the weekend, the rumor mill had suggested the former UFC heavyweight champion would divert to his fake fighting ways. However, professional wrestling fanboys across the globe were disappointed Lesnar didn’t appear in Sunday’s blockbuster WrestleMania event. With the presence of The Rock and Maria Menounos, there was clearly already too much star power for one pay-per-view broadcast to handle and that’s why WWE brass postponed Lesnar’s comeback until Monday. “The Next Big Thing’s” physique appeared slimmer than when he lost to Alistair Overeem at UFC 141 in December, though his face seemed slightly more plump. He emerged from backstage wearing a “Brock Lesnar” t-shirt written in similar font as the Death Clutch brand he used to don inside the Octagon. After interrupting John Cena’s speech, Lesnar entered the squared-circle and extended his hand as a sign of peace. Just when Cena went to slap mitts, Lesnar duped him and dropped Cena with an F-5 – his signature move of yesteryear. Lesnar didn’t say a single word on the mic. He didn’t have to because the capacity crowd was going bananas the entire time. The 34-year-old starred for the WWE between 2002-2004. Lesnar would join the world’s premier mixed martial arts promotion four years later. 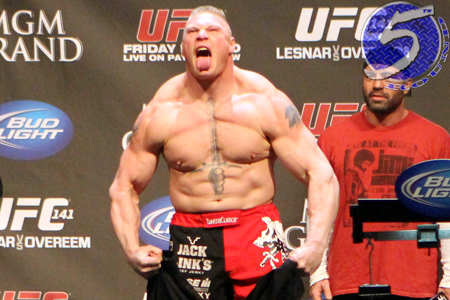 FYI – UFC president Dana White stated he wouldn’t have any qualms with Lesnar rejoining the UFC’s biggest PPV rival.